I mentioned yesterday that we were planning to stick to Sydney time while here at Ayers Rock, since we’ll only be here a few days. This leads to all kinds of interesting things like eating lunch at 9:30 or 10 am, Naomi going to bed at 5:30 pm, and all of us rising for the day at 4:30 am. Odd. But also kind of fun (at least for a few days). 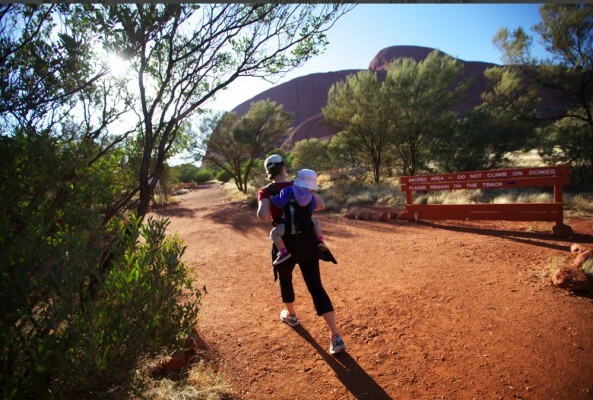 Particularly the early rising part is fun when you’re out in a place like Ayers Rock, because everything is so peaceful out here, and it’s the kind of place where you wish you woke up earlier so you could watch the sun rise (but, if you’re like us now that we have a toddler, you usually take all the sleep you can get). But, when the latest you hope your toddler sleeps til is only 4:30 am, you’re giving yourself plenty of leeway for sunrise. So this morning we were all up at 4:30, eating cereal out on our patio. It was a beautiful cool morning in the dark, with the exception of the tour busses rumbling by like bumblebees crawling out of water. I know that’s kind of a weird analogy and probably won’t help anyone but me picture it, but I just realized that’s what they look like, the way their external rearview mirrors hang down on either side of the windshield. Maybe we can get a picture for you. 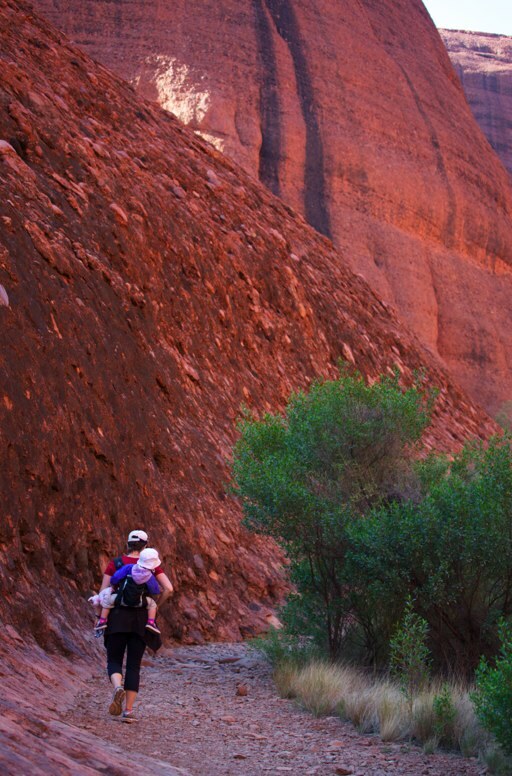 We were out the door by 5:30, heading for the Olgas. 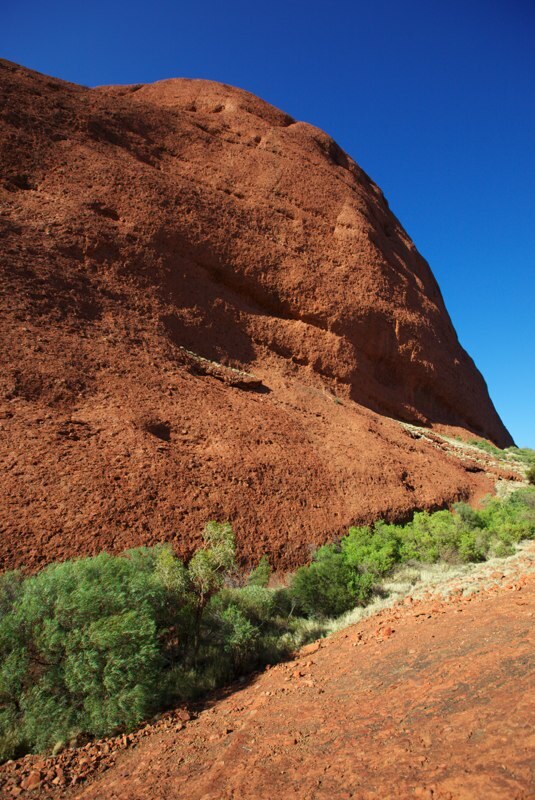 This was a somewhat last-minute change of plans, since I had really been wanting to climb Ayers Rock, the largest monolith (rock) in the world, and the original plan was to head there early this morning to try to get most of the climb done before it got too hot. 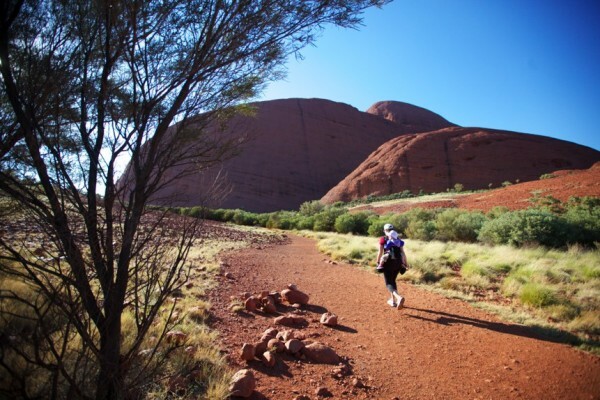 We’d heard that it’s PC not to climb Ayers Rock, but that a lot of people do it anyway, and I really wanted to. But then last night as we sat out on the porch in the rain, we were talking about it more. 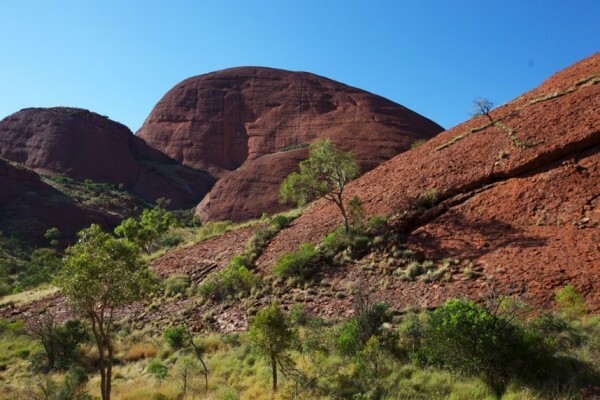 I realized that if I climbed it, I would just be contributing toward something I am already concerned about – namely, the attitude of Australians (or Westerners) toward the Aborigines (a separate post in itself. Suffice it to say here, I don’t know enough about this issue to really have a well-informed opinion one way or the other, but I’ve heard enough questionable things about how Aborigines have been treated since Europeans arrived 200 years ago that it’s something that causes me concern.) 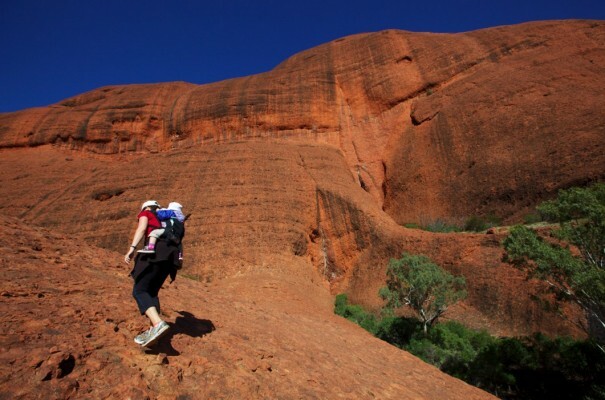 So, I decided I didn’t want to climb Ayers Rock. 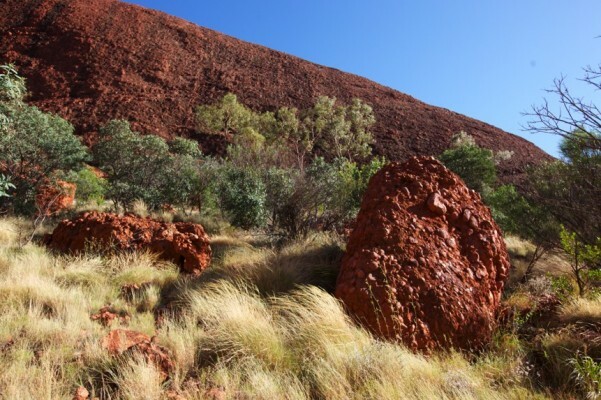 Instead we drove to the Olgas, a cluster of rocks that are huge in their own right, just not quite as big as Ayers Rock. 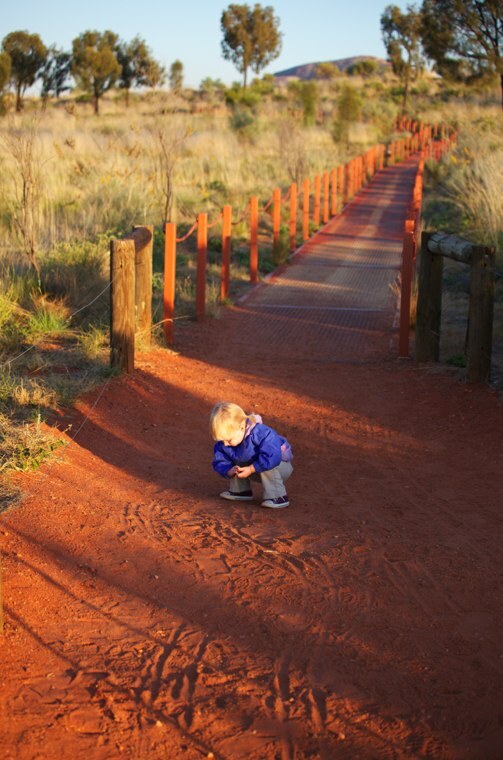 On our way to the Olgas, we stopped at a viewpoint right before sunrise so Daniel could get some shots. It was a beautiful morning (haven’t I already said that about 5 times? 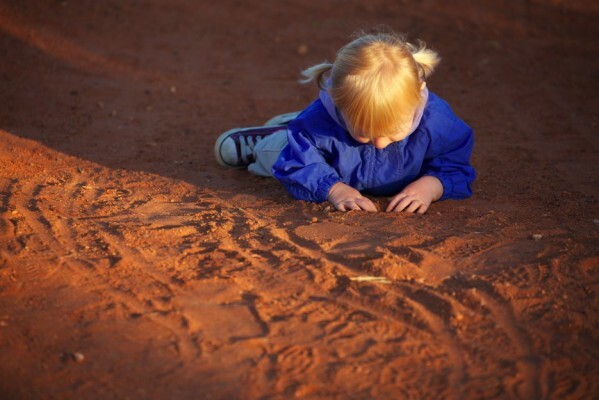 Sorry), and Naomi enjoyed playing in the red red dirt while I watched the electric sun poke its face out above Ayers Rock through some eucalyptus trees. It was nice to be out in that delicious cool, fresh air that I miss from super-early runs or backpacking. It was also really nice to be surrounded by silence, and made us both realize how much more “city” Sydney is than where we live in California (which, granted, isn’t the middle of nowhere, just not as loud). See how red the dirt is? This photo has not been post-processed at all! 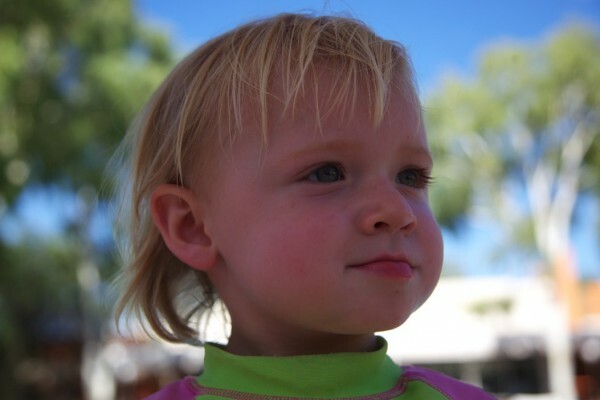 Her favorite place (and position) to be in, during our time at Ayers Rock. 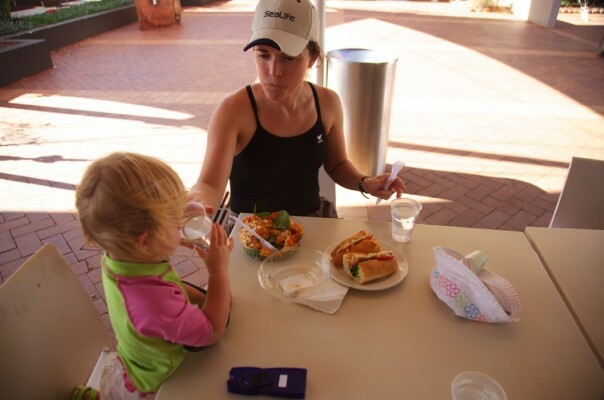 Then we headed to the Olgas, where of course it took us forever to get going on the hike because we kept getting delayed by things like making sandwiches, putting on sunscreen, getting hats, getting chapstick, getting an extra water bottle… etc. But once we got going, the going was good. After about the first 20 minutes I actually thought Naomi had fallen asleep, she was so calm and peaceful back there on my back. Daniel in the cool rest area at the trailhead, relaxing on the gorgeous natural-wood benches. 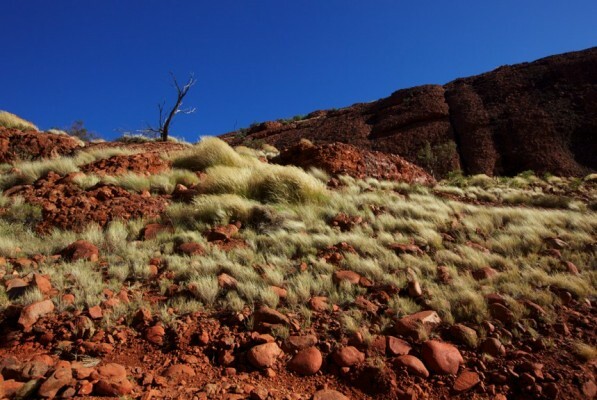 These bleached-white grasses whipping in the wind were a pretty contrast to the red soil and rock. I can tell you why it’s called the Valley of the Winds – that place is WINDY! Hiking down into the valley I wondered a few times if I would be blown over, since I was moving as well as carrying a toddler on my back. It made for nice hiking over all though because it kept things cool even though the sun was scorching from a very early hour. This picture shows the texture on the rock. Naomi actually enjoyed the entire hike from the vantage point of the Beco (carrier), which was a shock to us since it took us about 3 hours total and she didn’t get out at all during that time. She did sleep the last half hour or so, but prior to that she was just mostly silently enjoying the view. So that was a lot of fun. We’d kind of given up hiking for the most part these last 2 years because she obviously can’t keep up on foot and doesn’t usually seem to like being in the carrier that long. But we all had a great time this morning. 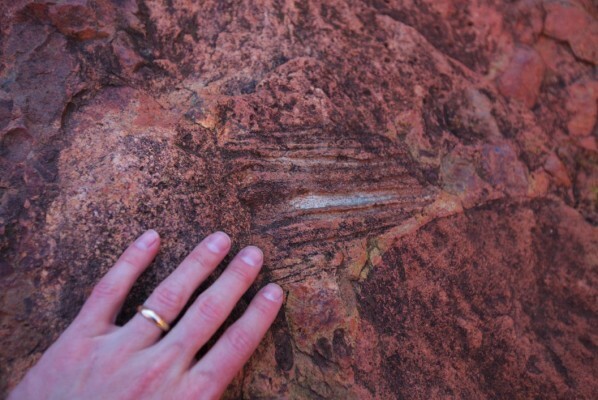 You can see in this shot the striation and layers of sediment on the rock, crossed by the vertical lines of water stains and algae lines from past rainstorms. 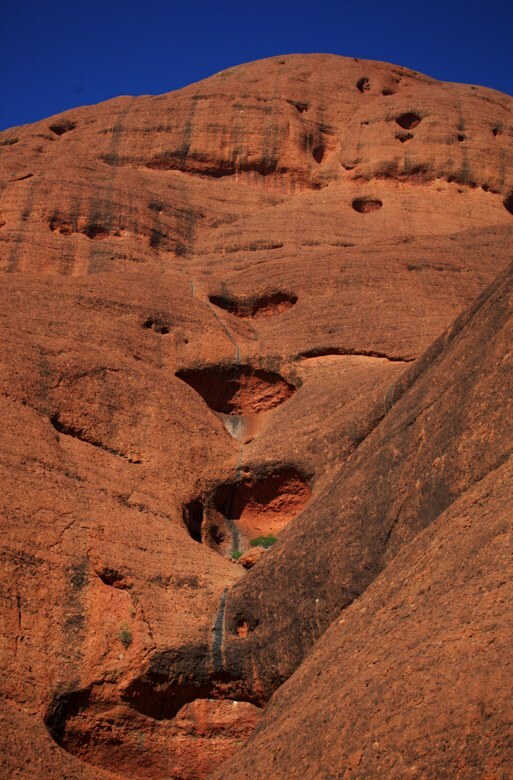 I would have loved to see the water cascading down these caves/bowls during a rainstorm! Each cave was probably at least 10 feet high. The red rocks there reminded both Daniel and I of a mix between Grand Canyon and Zion National Parks (for the redness and the narrowness of the canyon we hiked in), and Joshua Tree (for the rounded and unique shape of the huge rocks). 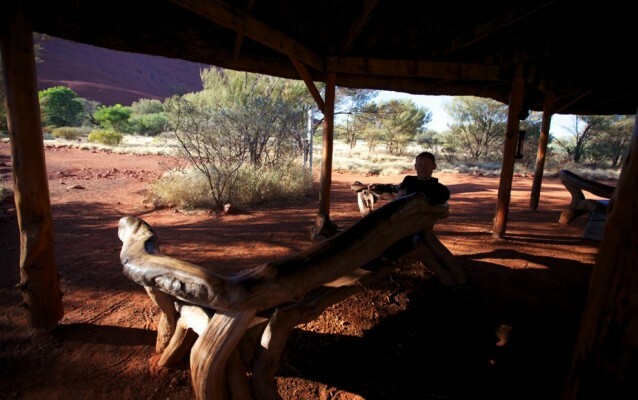 Thanks to one of our rest stops coinciding with a guided hiking group, we discovered this spot on the rock where Aborigines sharpen their hunting knives. In many places we saw boulders or mud clods like this - not sure if they are rocks imbedded in rock, or rocks in soil but they looked neat. Someone we met along the way said kangaroos are often viewed in the canyon in the early morning hours, which would have been incredible to see, but I think it was too late by the time we got there, and we didn’t see anything. The end of the hike was tough because we thought we were about an hour closer to the end of the hike than we actually were, and we were trying to encourage Naomi to stay awake so that she could a more solid nap in the car. But ultimately we got out of there and ate as much salty food in the car as we could get our hands on… which meant we almost finished a bag of Chicken flavored potato chips. Don’t ask me why anyone came up with that as a flavor for potato chips but it hit the spot after a long hot hike, although we would have preferred crackers to chips. Oh well. Salt is salt. We got home and chilled out in the hotel room a bit. Naomi got very absorbed in some big secret project involving the locks to our luggage and my makeup bag. Then we put her down for a second nap (since the first had been very brief and floppy, since she was in a carrier on my back and I was hoofing it up a mountainside), and we both took a nap as well. After that, we headed to the pool. Today we sampled the pool at our own hotel, rather than the pool we’d tried out yesterday. This pool had the advantage of much nicer surroundings, but the disadvantage of having no kiddie pool. In fact the pool didn’t even have steps down into it – it was a do or die situation with ladders only, descending into a minimum of about chest-level water. Yikes! And not only that, the water was icy. It took me – no exaggeration – about 10 minutes to ease my way in all the way up to my neck. Once I got there, I lasted about another 4 minutes and I started to feel chilled inside, so I got out. Daniel took the braver route of jumping in, but he got out within moments as it was just so cold. Naomi put her feet in but that was all. Happier out of the water than in it. Then we walked over to the same deli we got paninis from yesterday and ate dinner. Aaaaat 3:45 pm. Yup. This time there was more selection so we got a bacon and egg panini, a chicken and avocado baguette and a pumpkin salad. The pumpkin salad was pretty good, but I thought maybe it would change the way I want to use pumpkin at home and it didn’t really. It had feta cheese and pine nuts and spinach, with some kind of mustard vinaigrette – good but not great. Naomi actually ate some pumpkin, but then gagged it out when she hit a spicy piece of mustard. Starting to be pretty good at drinking out of a cup. 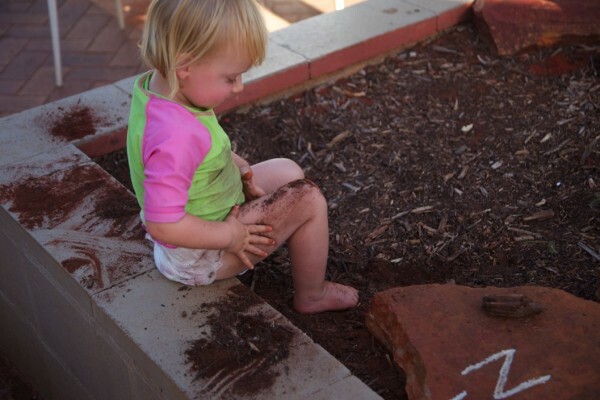 Then Naomi completely lost herself in one of the planters of red dirt, digging and digging and digging, and eventually just pouring dirt onto various body parts and rubbing it in. It was pretty glorious. Then it was home for a bath and bedtime. Tomorrow we finally head home (to Sydney)! It has been a long week.